CD review: "Friends for Life"
During the 1980s and '90s, San Diego unfairly found itself viewed from afar as the home of "jacuzzi jazz," the contemporary non-jazz easy listening format popularized by Fattburger and radio station KiFM. Closer to the truth is the reality that the real San Diego school of jazz, while as bright and sunny as Kenny G., is still real jazz. it has musical heft to it. There are complex rhythms, solos that are improvised on the spot rather than memorized, and some stellar musicianship. Want to know what San Diego jazz is all about? 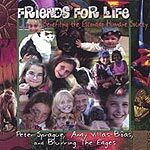 Then check out the new fund-raiser CD that Peter Sprague and his friends put together for the Escondido Humane Society. The music found here from Sprague, Fred Benedetti and Andy Villas-Boas is definitely sunny; there is nothing heavy or ponderous to be found. Brazilian and other Latin themes abound, and the songs here are awash in tropical feel. You can practically smell the sunscreen. But bright and sunny doesn't mean an absence of solid music. Sprague and Benedetti are both top-notch guitarists, and the various incarnations of their bands (along with that of Villas-Boas) feature some fantastic players who improvise solos that are imaginative and virtuosic. Odds are, given the purpose of this album and how it's being marketed, that most folks who buy it won't be thinking about the music at the time of purchase. When they do pop it into the CD player, though, they're in for one nice surprise.